Anybody know what this is? How did it happen? There may be multiple reasons. Did you reglue that insert before clearcoating? Maybe clamp it down to hold it in place? 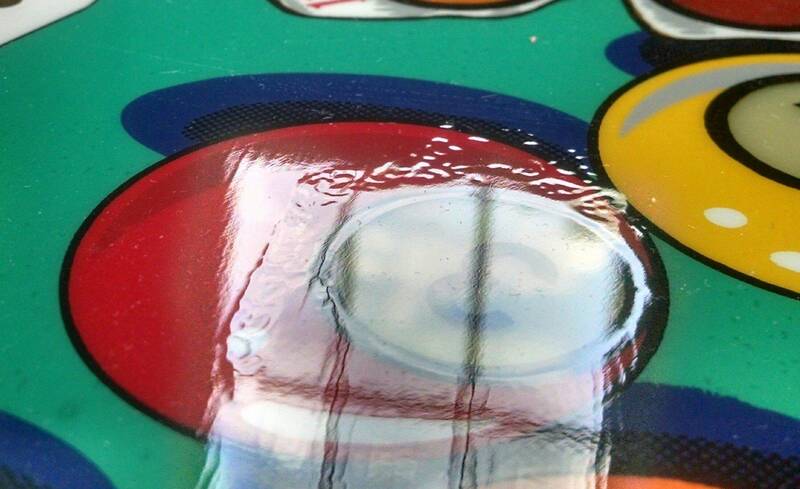 I recently used wax paper between a rubber block and the playfield. The wax paper left a residue that had to be thoroughly cleaned off with naphtha before any touch up paint would adhere to it. No this is a CPR gold playfield that has been in my closet for almost a year. It's been stored in the box it came in. Send it back to CPR. Ask for a replacement and or re-surfacing. At $700-800 a pop, they can do it. If you didn't follow the instructions, I would say it's on you. Is this everywhere or just a few spots? Was it like this when you got it or did you not open it? Sanding and buffing would probably improve it, sanding and re-clearing would make it better than it was out of the box. Agreed, I am sure they say that so you can quickly get an exchange while they have them in stock, but this is pretty easy to see as a failure. It's is in 3 spots. I've bought a half dozen playfields from them without any issues. I did take it out of the box ( who wouldn't) I can't say I looked closely at this one when I received it. I bought it before I even had the game and just put it in the closet. It's is in 3 spots. I've bought a half dozen playfields from them without any issues. Was told to come read this thread, so here I am. Haven't heard anything about this until now, although I'm not the one who works the general inbox at the web site (if that is where you wrote). I suspect that due to the traffic on that inbox, it's long scrolled up and off the screen and overlooked by our two fellows who run that inbox. I'll be going to find out on monday, nonetheless. Regardless, here we are a year after shipping - and this is what you are seeing/showing. 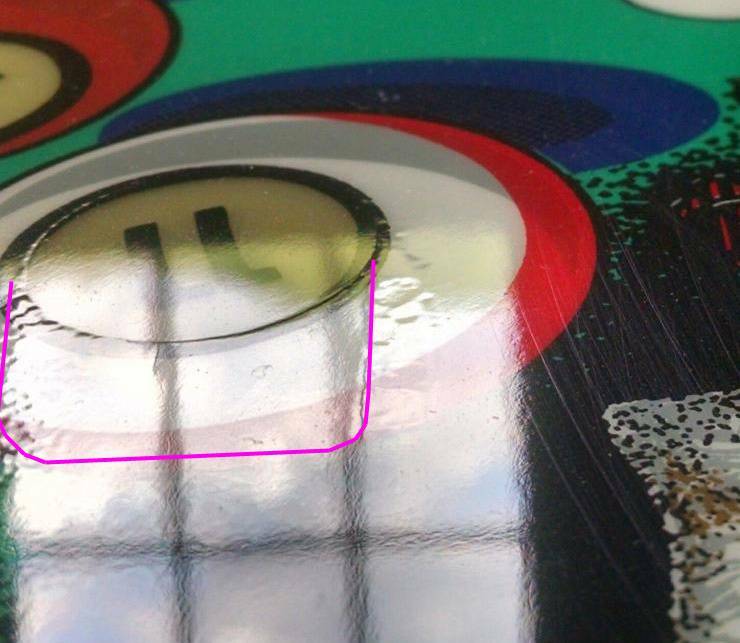 I notice YOU didn't make any accusation toward us shipping you a defective playfield that looks like that (it was others that inferred our alleged culpability). 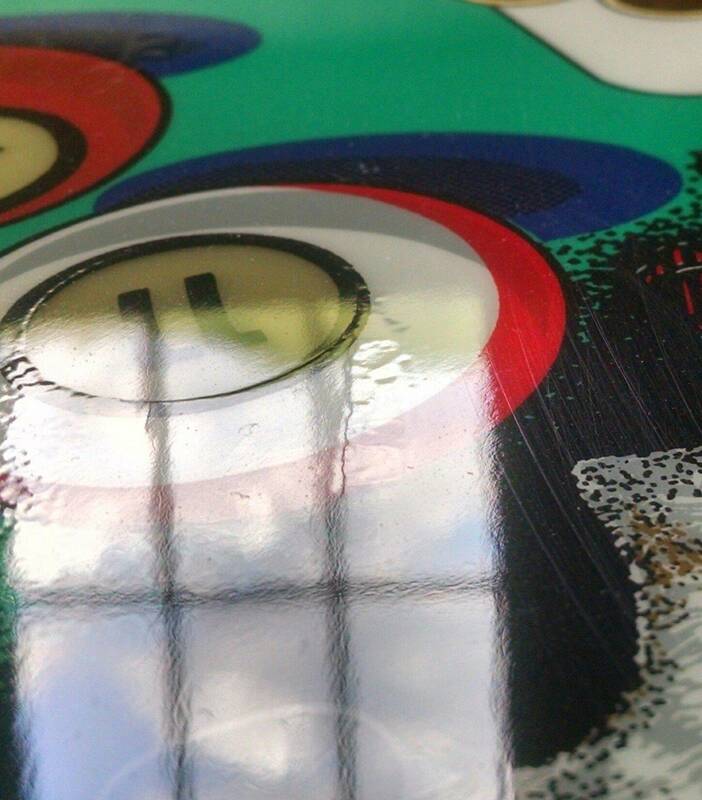 You even mention you don't recall for sure ever looking at the playfield upon delivery. Although I can tell you - most people certainly do - and usually quite excitedly, in fact. Now I'm not going to put words in your mouth, but I'm just getting the impression there is some fogginess in memory of its arrival a year ago. Maybe I'm wrong. Was it opened, looked at briefly, not immediately needed, thus put away ? That's what I'm getting. I would assume it was opened, and at least looked at, upon delivery. If so, and I'm only assuming, I would suspect clearcoat markings like that would certainly have been noticed on day one. Even with the quickest 60 second look-over. Wouldn't you agree? I can tell you that no playfield got past my 5000 lumen studio lights, during my grading inspection, glaring the surface, inspecting artwork, etc. In fact, our clearcoat doesn't *do* that texture. There are no napthas, no waxes, no residues, no silocones in our processes. Remember, clearcoats are 4 layers sprayed over many days. Hardened, sanded, etc. Topcoat sprayed perfect as possible, under piercing bright lights. There is no way patterns like those can happen, let alone get unseen during grading, let alone get graded as a near-flawless gold grade. So I'm just stumped at how the EBD playfield that landed to you a year ago, looked like that out of the box. Can you post a picture of the THIRD spot ? I'd like to compare to the other two you showed. Is there anything you can think of, within the last year, that may have involved 4-sided round-cornered objects or pressure-points against the clearcoat? Which is strange to ask, but I have to. Because it's not just something touching... it's something that actually effected the clearcoat. Which is even more complex. Anyway, we CAN sand off and re-shoot clear, if shipped back to us. I would like to solve the mystery, though. I would like to get to the bottom of what is at fault here... noting that I realize you aren't casting fault. Neither am I. But some reading this thread may! More information is needed, of course. My PM inbox is there if you need it, as well.